At more than 110 years old, air conditioning is still a modern marvel. However, one element of cooling design urgently needs an update: the thermostat. Right now, the typical thermostat does a fine job of keeping the room where it's mounted (the hallway) at a comfortable 72 degrees. Elsewhere in your house, though, things are different. The heat outside is making your bedroom uncomfortable (75 degrees). You're dozing off in your home office (76 degrees) and you're roasting in the kitchen (79 degrees). From the thermostat's perspective, though, your home's climate is perfect. Most thermostats only know the temperature of the room they're in. That's why they're typically in the hallway: as a central location, it's the best place to get a ‘single' temperature reading for the whole house. When summer temperatures soar, however, this ‘one-size-fits-all' approach can fall seriously short on delivering comfort. Away from the thermostat, "hot rooms" develop, upstairs or on the sunny side of the house, usually requiring a trip to adjust your (blissfully unaware) thermostat before you use the room. The Alarm.com Smart Thermostat is different to other thermostats. Engineered with advanced technology and connected to your smart security system, it understands more about what's happening around your home, and takes intelligent actions on your behalf. For hot rooms, and other everyday challenges, it has temperature sensors, small devices that you can installed on any wall in any room. Each sensor feeds the temperature of the room back to the thermostat, giving it multi-room temperature awareness and the ability to mitigate hot rooms with an approach known as precision comfort. 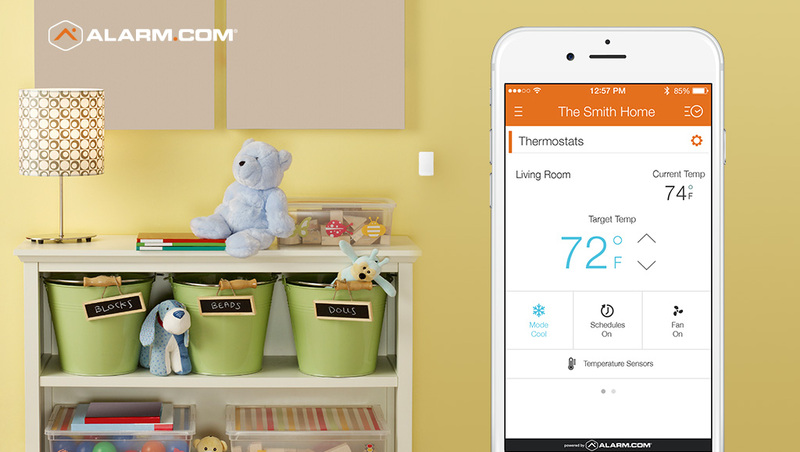 Precision comfort lets you switch the Alarm.com smart thermostat's main point of reference (e.g. the hallway) to any temperature sensor in your home. If you want 72 degrees in your bedroom, you can specify 72 degrees at the bedroom temperature sensor, and the thermostat will cool the house until your bedroom is perfect. 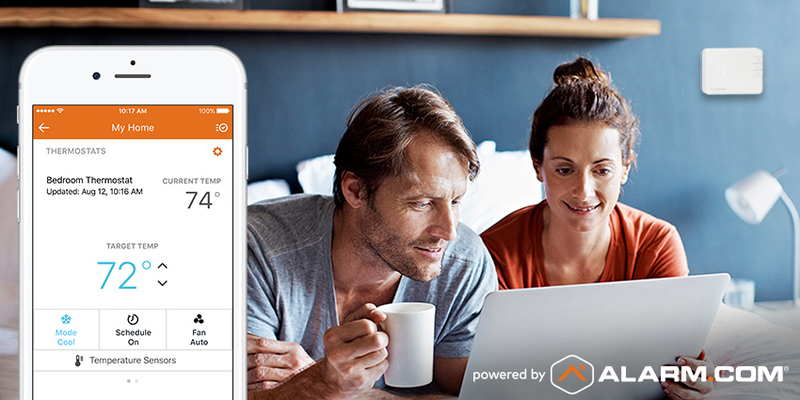 With temperature sensors installed in the rooms where comfort matters most, homeowners can create a smart cooling schedule, customized to their home's everyday activity. For example, you can specify 72 degrees targeted to the living room temperature sensor in the evening, followed by a cool 70 degrees at the bedroom sensor when night falls. In the morning, when you all leave, your schedule can revert to the main thermostat, targeting 75 degrees to save energy. The more specific your routine, the more specific you can be. Do you work from home on Wednesdays? Install a temperature sensor in your home office and assign it control on Wednesday's only. The rest of the week, your thermostat will ignore it, potentially saving you some energy by not targeting a typical hot room. If your family's routine is unpredictable, or you don't typically congregate in one room, you can ‘average' your temperature sensors to create a more balanced level of comfort around the house. 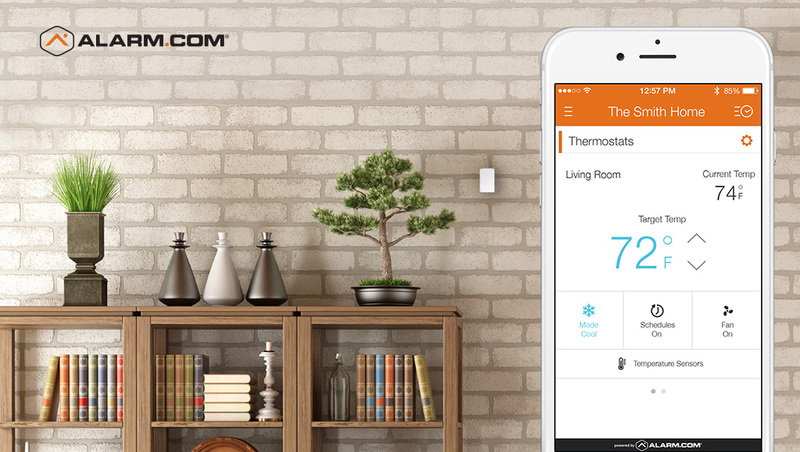 To create an average, select the sensors in the rooms that matter most, and instruct your thermostat to target an average temperature between them. For example, in the evening, you can target your comfort around the main thermostat area, the living room, and the nursery, for a level of general comfort that takes everyone into account. Sounds comfortable! But what about my energy bill? The Alarm.com smart thermostat also has a huge range of energy-saving techniques—including some that other thermostats just can't deliver. To find out more, click here. 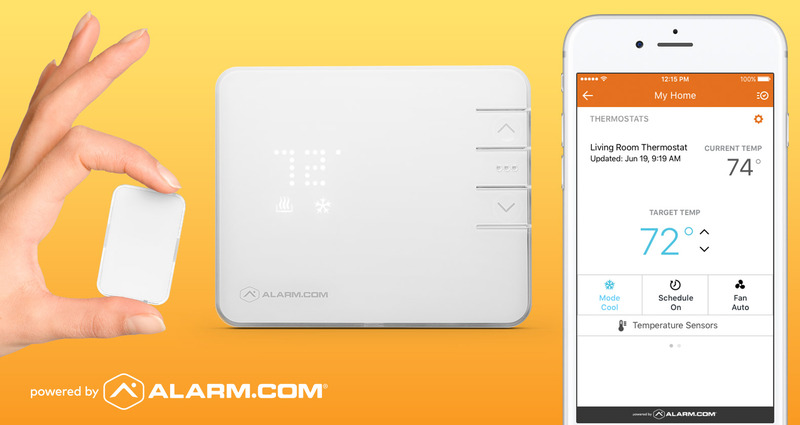 Feeling the heat and ready to connect with an Alarm.com service provider? Just enter your ZIP code into the box below.